‘Home center’ is a software-interface for your home automation system. Ideal for control via touch screen, PC or mobile device. 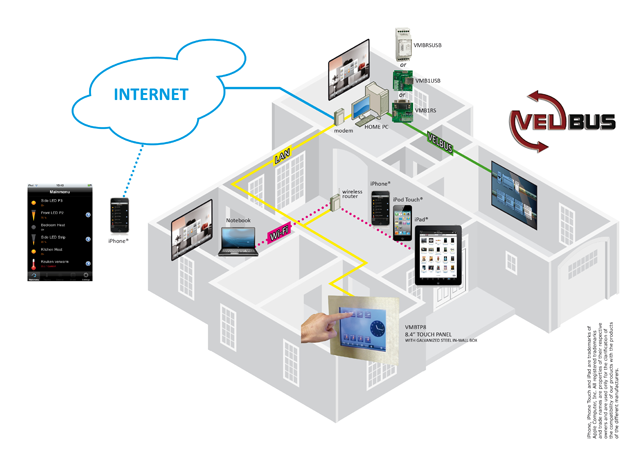 All home automation functions of your whole house are available at a centralized location. The lay-out of the software can be completely adapted as desired. Create windows and add the buttons. Every button can be personalized and even set up to display the status. Organize the buttons according to your own likes thus grouping functionalities. Or any other combination that suit your needs! 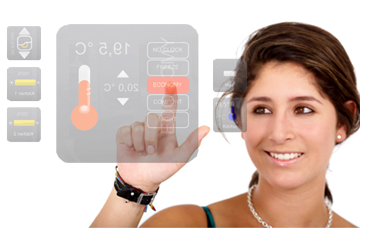 Control of each component is done via a simple click or touch on the touch screen. The control of other windows is also only one click away. Personalize it with a nice desktop and place all extremely handy buttons on it. Choose a nice picture, image, or use a floor plan or picture of your living room and organize all functions of that room on it, why not? Home automation outputs (switches, sensor, doorbell…) can automatically trigger camera images. E.g. when somebody rings the doorbell the camera at the front door is activated and you see immediately who the visitor is. On the image you see the available options, e.g. light on/off, open door, alarm… Multiple cameras can be connected to the home automation system this way. Of course it is always possible to view camera images manually through the software. Homecenter is integrated in the VMBHIS with 1 year of free updates.